I am following step by step your notes to configure the CA module and i am blocked at post #3 last step. 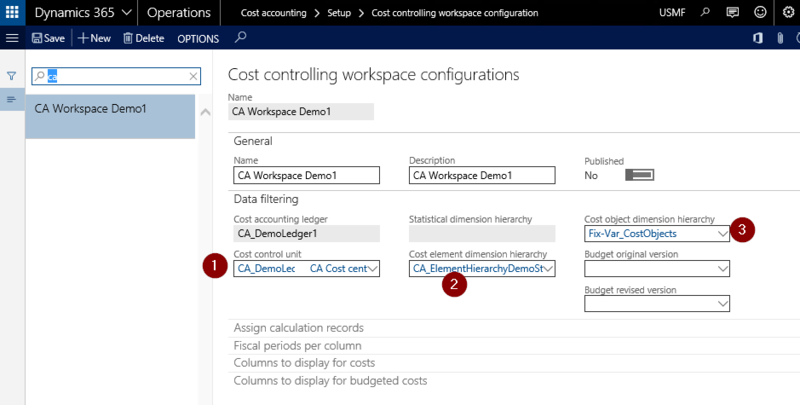 In your notes, you create a cost object hierarchy by the name of CA_ElementHierarchyDemo and in the last step where we configure the workspace, you say to connect 1, 2 and 3 . 3 beeing the cost object hierarchy and you connect a different one which is called Fix_Var_CostObjects. I am experiencing the same issue. Where i am able to connect 1,2 and 3 the cost object hierarchy i created does not appear. the drop down is empty. First please tell me why did you connect a different hierarchy from the one you created in your own steps. And maybe that is the same issue that i have? 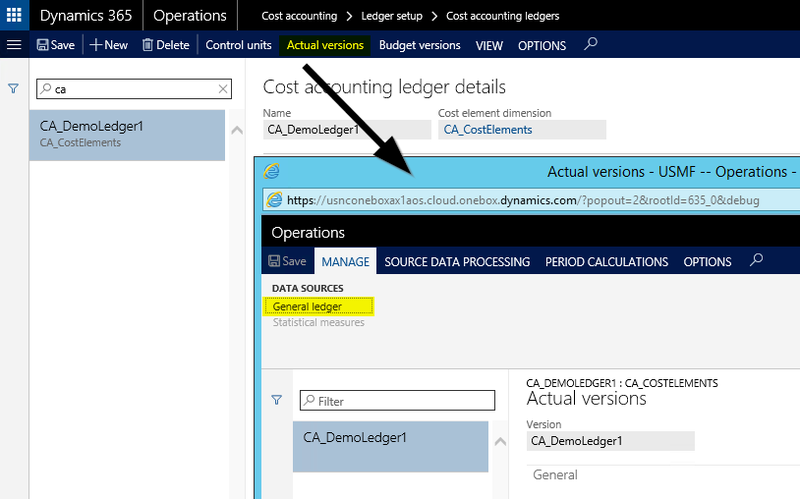 Hello Ludwig, I tried to do the setup like you described but no matter what, my I’m not sure what I have done wrong (I also tried to follow the steps on https://docs.microsoft.com/en-us/dynamics365/unified-operations/financials/cost-accounting/cost-accounting-home-page) but if I have a look at my journal entries, I do see my journal, but no data at my cost entries so also no data if I check Cost Control. Do you have any idea what it could be? Thank you very much. 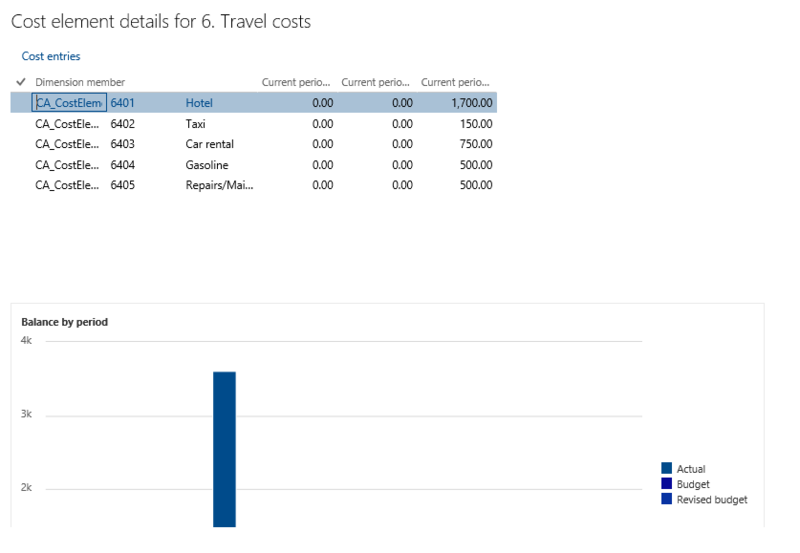 1) that the cost control unit verifies that the data being imported to the CA module are correct i.e. the transactions have a dimension that is in the cost control unit. 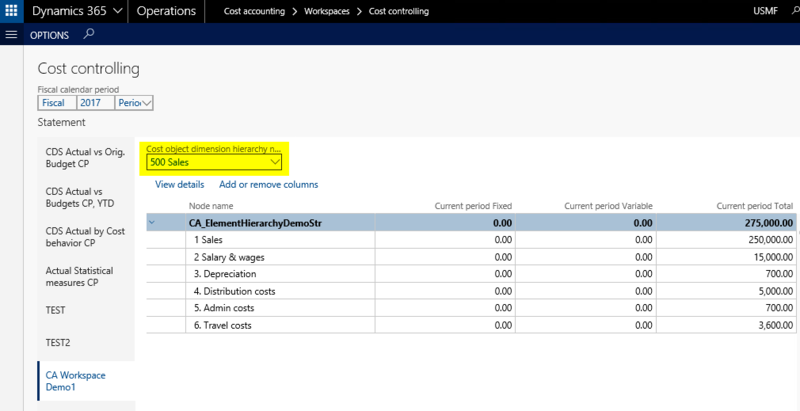 2) In the cost control workspace setup based on the cost control unit it is possible to choose the cost object dimension hierarchy. What eludes me is what is the significance of having these control units in a hierarchy. The cost control unit represents the cost structure. The structure determines how cost flows in a hierarchical order between cost object dimensions and their respective cost objects. Practically the cost control unit is typically the financial dimension that you want to analyze such as your departments or cost centers. The reason why they are arranged in a hierarchy is because companies often have a lot of cost control units and their top management is not interested in all details but only in the summarized nodes of the hierarchy. 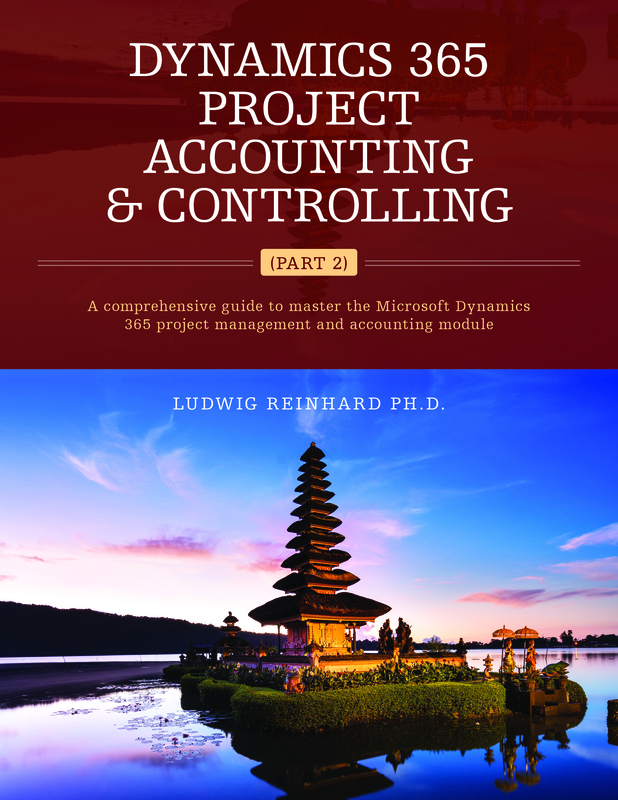 I really liked to read what you wrote about Cost Accounting in Dynamics 365 and it has been helpful setting up the Cost Accounting module. I have a question about Control units, which I hope you can help me with. I have created a hierarchical structure consisting of three financial dimensions. When I retived data from General Ledger, I do not get cost objects for all dimensions. If I test the same setup in Microsoft demonstration company (USMF) and it works as I wish. I have a hierarchy of cost units in three levels. I have also Organization Hierarchy containing Department (level 1) and Cost center (level 2). If I look at the journal (containing data retrieved from GL), it contains all financial dimensions (Department, Cost Center and Segment), but when a look at the cost object I sees only cost objects for the Segment. I have also tested to create Cost Accounting ledger with only Department and Cost center, but I only get Cost Objects for Cost center. Do you have any idea, what can be the problem with my setup? I need to set-up the cost accounting module for an organization that wants to allow their cost control managers to follow their budget vs actuals based on a combination of financial dimensions (Business unit & Departments). I have not been able to filter the data for more than one cost object, which is the one specified in the cost control workspace. I would have thought that the purpose of having a hierarchy of cost control units would achieve that goal but my test results are inconclusive. Can you please provide guidance on how to achieve the multiple dimensions filtering if it’s even possible? I will share a document describing my tests in a sandbox environment, as a reply to this post. If you have a standard MS demo/test system then you should be able to find an already setup cost accounting ledger ‘USP2’. 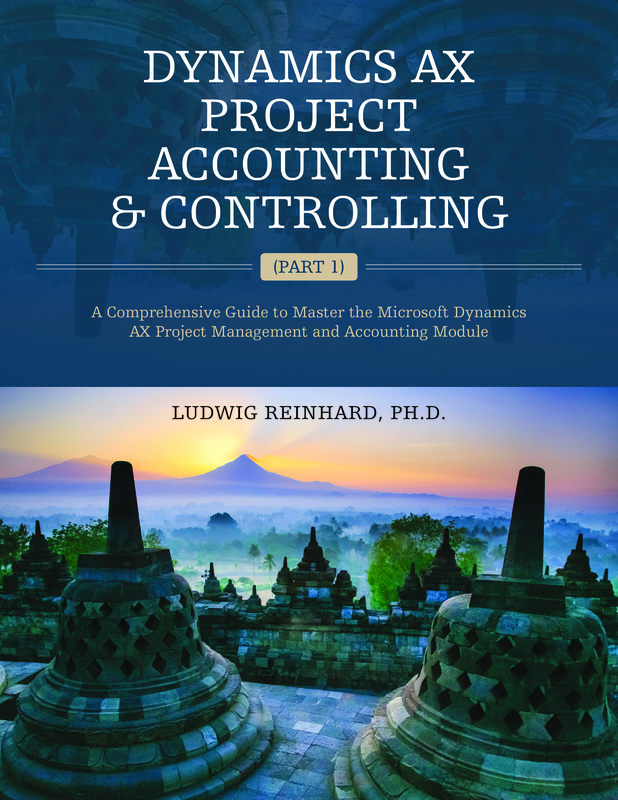 This cost accounting ledger has two control units setup (cost center and product group). My recommendation would be investigating the setup of this cost account ledger in order to compare it with your setup. 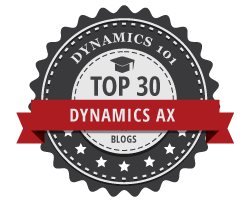 I believe you can quickly identify commonalities and see how a cost accounting ledger with more than a sincle cost control unit can be setup.